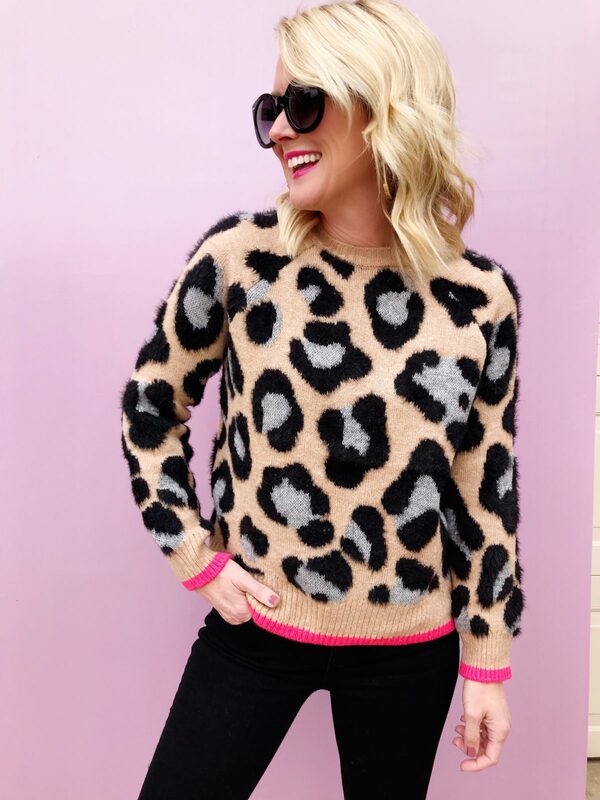 8 Darling & Affordable Sweaters You Won't See on Everyone Else! | hi Sugarplum! 8 Darling & Affordable Sweaters You Won’t See on Everyone Else! 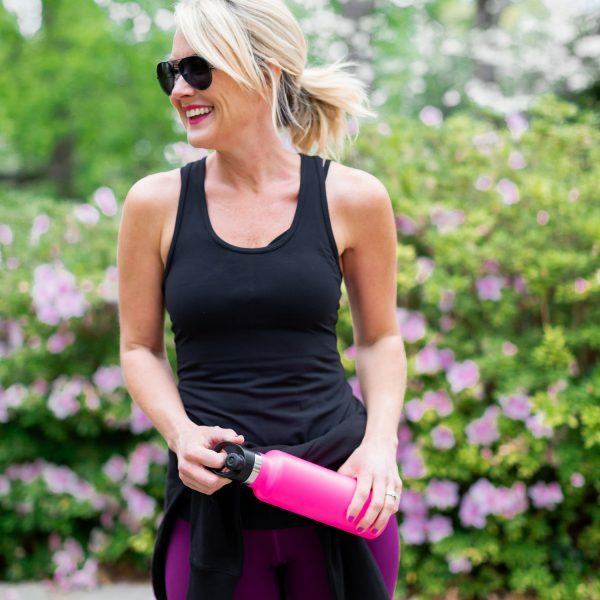 Thanks for the love on yesterday’s Tips for Staying Sane During the Holidays post…I loved hearing how you stay focused and calm this time of year, too. We’re on day two of Thanksgiving Break, and I’m already practicing them all! My kids are past the bickering phase, but have moved on to the wallowing phase! For some reason, I can only handle that for a day before I start barking at them to get up and move. Please, just do something! #amIright?! What gets under your skin most when you’re kids are home on school break? Moving on, I’m super excited for today’s post!! I’m always scouring the internet for the newest and cutest, but tend to stick to my go-to retailers. But I discovered Marks and Spencer, a new-to-me brand, on our trip through the British Isles, and jumped at the chance to work with them on this Lace Dresses Under $100 post. And was even more excited to discover many of you adore them, too! The prices are amazing, unbelievable actually, considering the style and quality. And since it’s a British-based brand, you’re not likely to see your neighbor or another school mom wearing the same thing. We’re in the middle of another crazy-cold front, so I couldn’t help but be drawn to the sweaters (or jumpers as they call them! ), and am so smitten with what I found. Sidenote: They’re UK-based, but transactions are in US dollars, and express shipping is free over $50! I don’t usually go for themed sweaters, but I’d wear this ‘Merry & Bright‘ in a second! 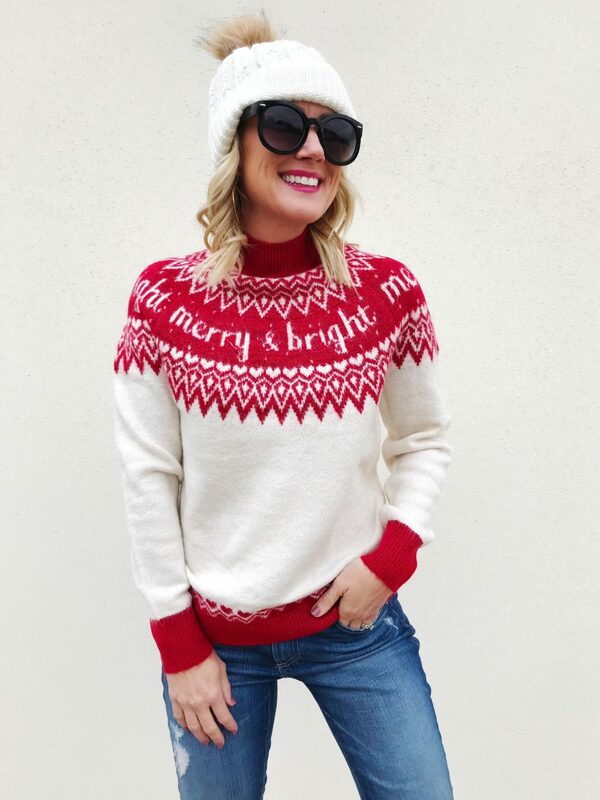 The fair isle pattern, red and white combo, and mock neck collar are just so fun and classic. Plus, it’s super soft and warm. 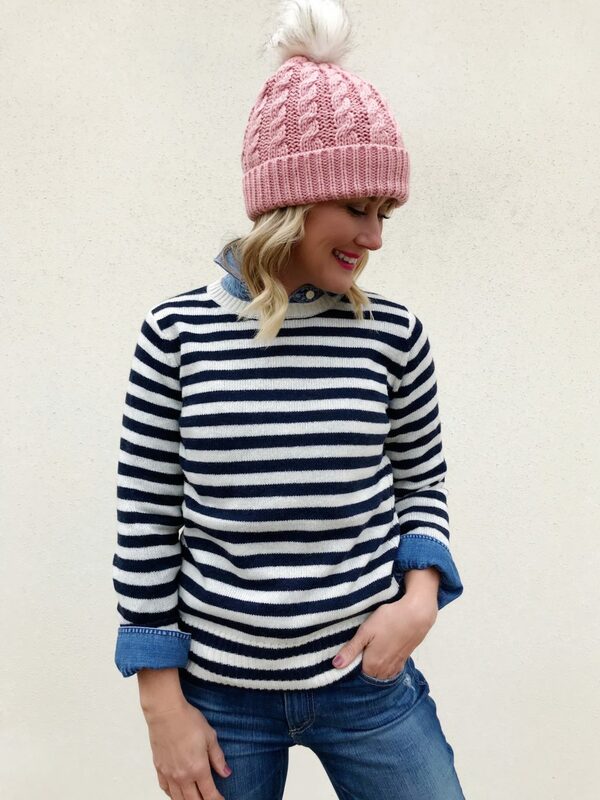 I never met a stripe I didn’t love, and especially during layering season. They make the best base for layering over plaids, or under vests. This wool crewneck is warm and thick with a wide, ribbed waistband. And the pom-pom cap? Only $25!! It’s the perfect size and fit…I grabbed it in three colors! This cotton-blend crewneck is a great closet staple, but anything but basic. It’s thick and stretchy, making it perfect for layering. Plus it comes in a slew of colors and is only $20! 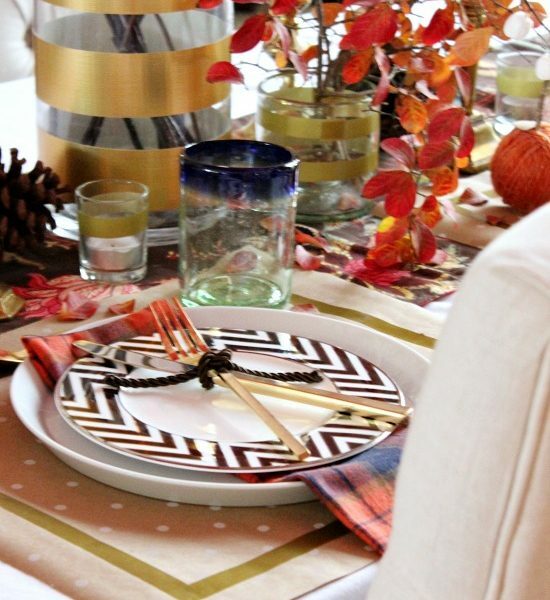 How fun is this fair isle!? I adore the vibrant colors, plus it’s thick and warm with a mock neck collar. It’s a little longer with side slits for a relaxed fit. 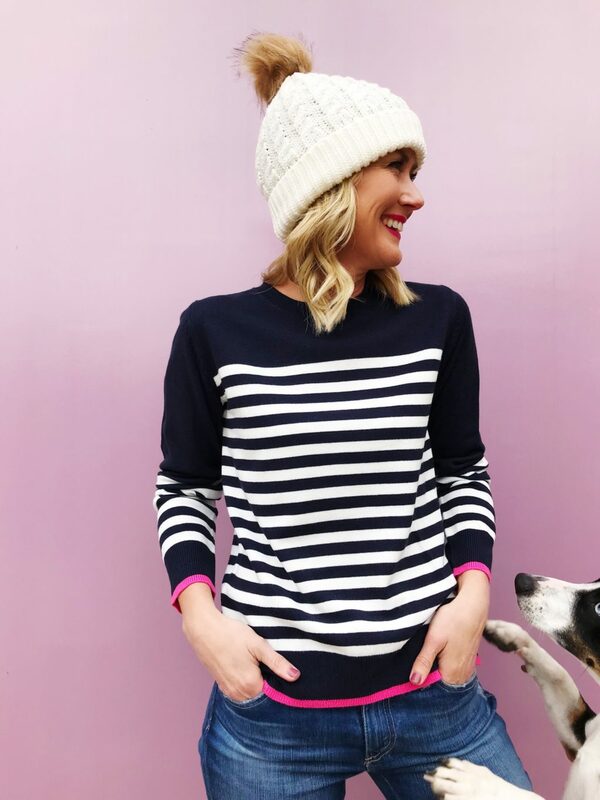 More stripes with a pop of pink! This crewneck is a soft cotton-knit blend, that’s extra-soft and stretchy. 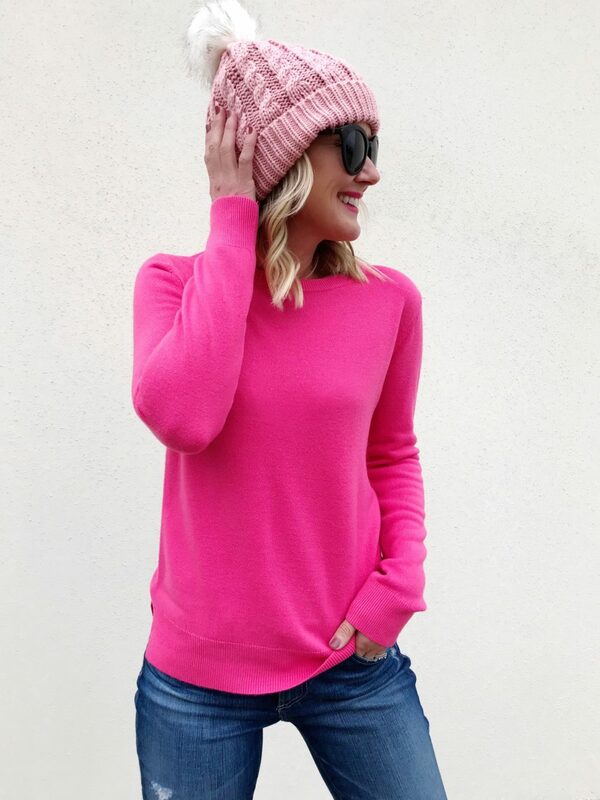 The navy and pink is preppy perfection. Photobomber pup not included. 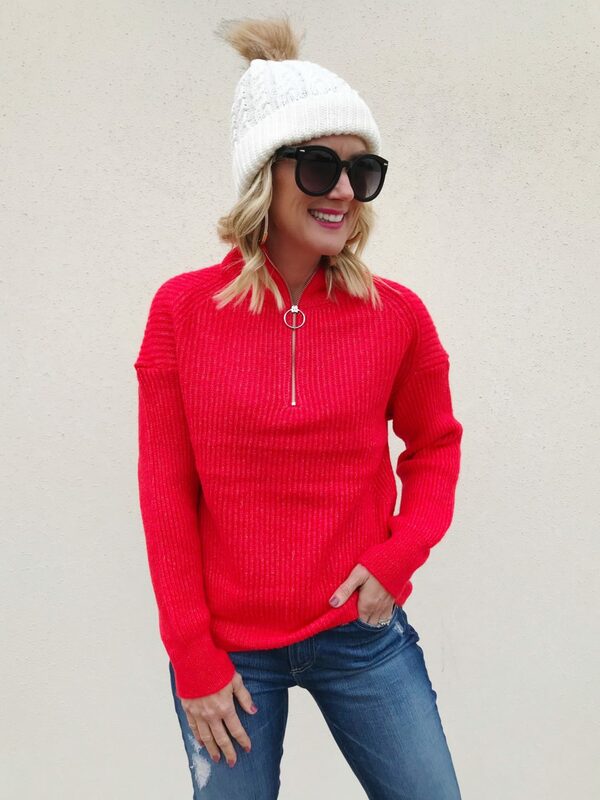 It’s hard to see in photos, but this vibrant red sweater has a subtle metallic thread throughout…making it just a little extra, and so fun for holiday season! It has a tall mock neck and cute O-ring zipper. 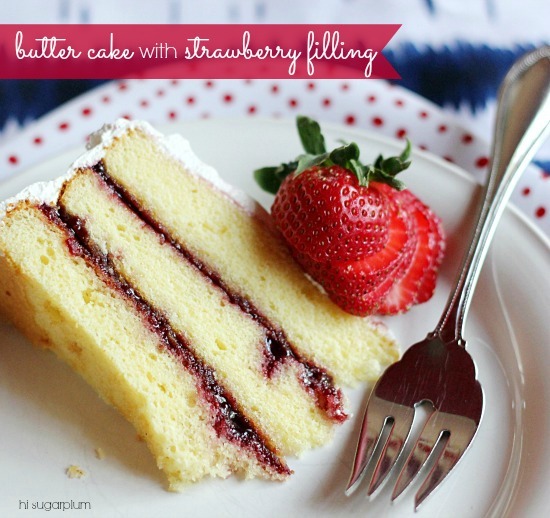 It would be darling layered over a plaid, too. 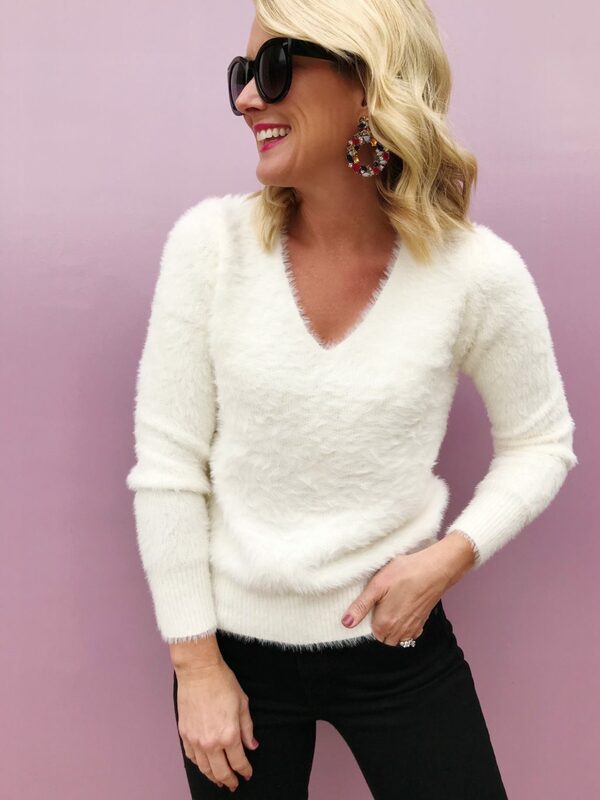 This v-neck sweater is soft faux-fur, giving it a luxe feel and style. Dress it up with trousers and heels for a night out, or stay cozy with jeans and boots. That’s barely scratching the surface of amazing finds at Marks and Spencer!! 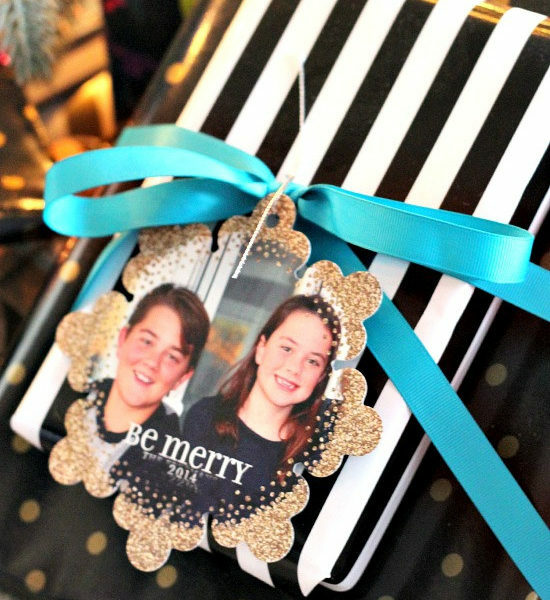 Check out these fun gift ideas…all under $50! one // Catch Phrase Card Game Small game sets like these are stocking stuffer faves in our house, and Catch Phrase is one of our most-played. Find all cards games here. two // Girls Fair Isle Sweater Maybe the cutest sweater for little girls ever!! I love the pattern and rainbow combo of colors. three // Plaid Faux-Fur Slippers How can you deny plaid slippers? Especially when they’re fur-lined? four // Sequin Clutch A gorgeous clutch for all your holiday styles. 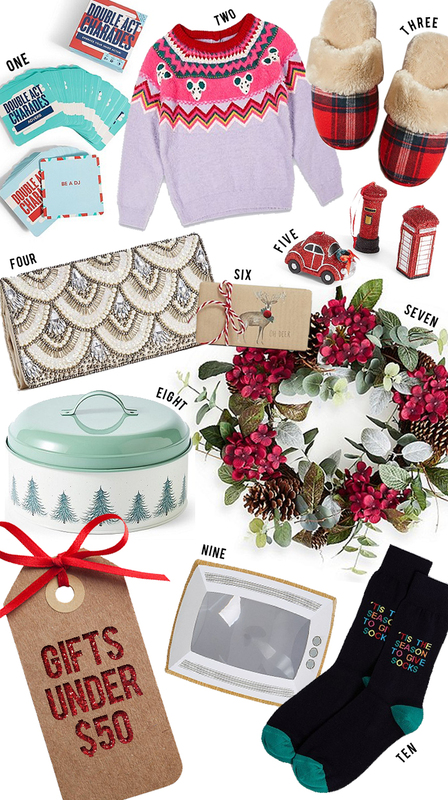 five // London Ornament Set Have a traveler on your list? This trio of London Calling ornaments would be a fun gift. six // Holiday Guest Soap I never show up empty-handed to a party, and this cute holiday guest soap would be the perfect little hostess gift. seven // Holiday Wreath Add this gorgeous wreath to your front door, over your bed, on the mantle…so many spots to add a touch of holiday for only $31. eight // Pine Tree Cake Tin Love the vintage style of this cake tin. Such a fun gift for the chefs on your list, or serving your own holiday yummies. nine // iPhone Projector Box Turn your phone into a movie projector!! I grabbed this fun gift for Little Miss, I know she’ll love it for sleepovers. ten // Holiday Novelty Socks My mother-in-law always gifts the men in our family funny socks, and it’s become serious business among them! They swap and trade, and even fight over who got the best ones! I’m definitely passing this fun sock source on to her! 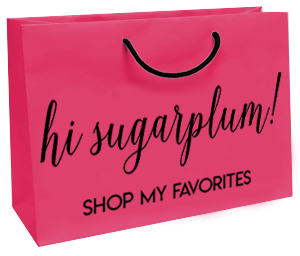 Have I convinced you to take a look at this fun retailer? They’re wildly popular in the UK, so I’m sure it’s only a matter of time before they find their way here. Until then, I’ll keep their awesome website bookmarked, and take advantage of free express shipping (my orders usually arrive within 2-3 days!). Check out the comments in this Holiday Style Under $100 post for the passionate support fellow HSP readers have for Marks & Spencer, and the things they like to shop most. What was your favorite new find from this post? Do you like seeing new and different retailers featured here? Such cute sweaters! 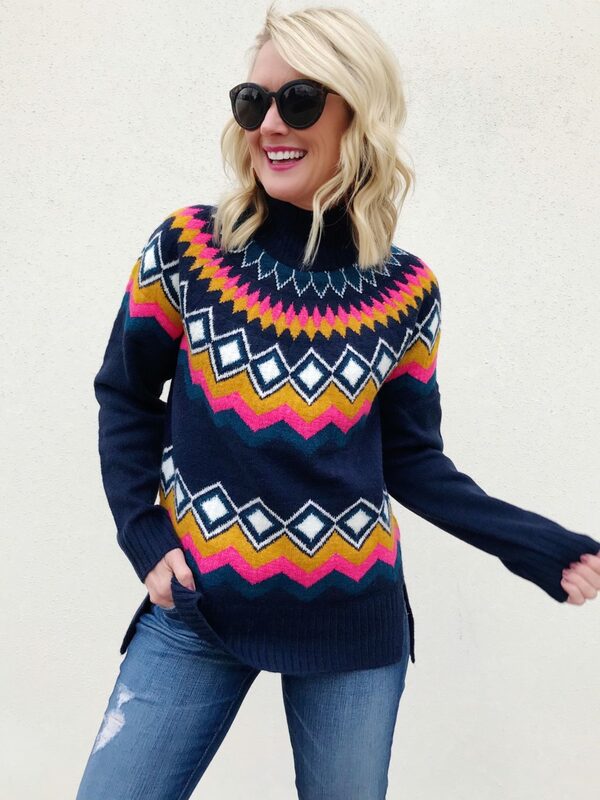 The navy fair isle turtleneck is my FAVORITE! 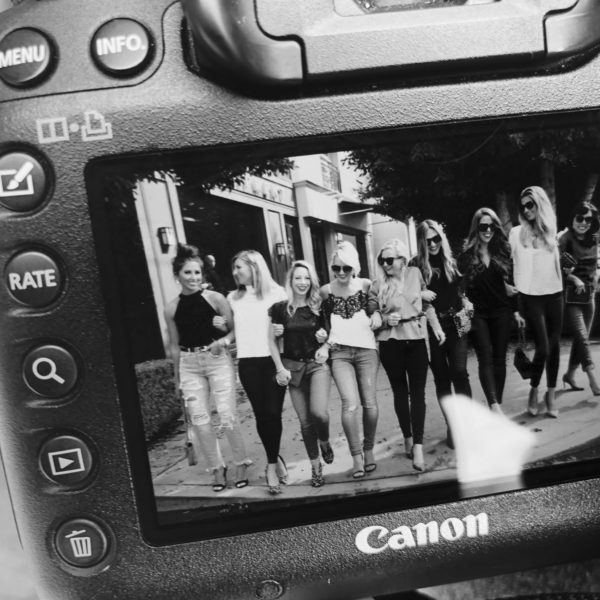 What blue jeans are you wearing in these pictures? Ooops, I should have totally thought to include that info! Both are a great fit, and true to size! Hi! I received these black jeans in the mail today. They.are.awesome! FINALLY (thanks to Cassie) I have found a super black pair of jeans that have good stretch, are slimming, and don’t gap in the waist! Hoping they do not bag out. Cassie, have you had any stretching out or relaxing with the black jeans? Yay!! The Liverpool jeans?? I literally wore them 4 days straight, and each day fit like they were straight from the dryer! I was checking out their cute Llama socks but not sure of the sizing if I’m US 7.5 shoe size. Do I go for the size 7 and under or 8.5 and up? Did you try their socks? Thanks in advance. I haven’t tried their socks yet (shoes, yes! )…I’d probably go with the size you’re closest to?? Hey, fellow TCU horned frog and dog lover here. We are living in the UK now but come home to Texas for visits every few months. I had to chime in and say M&S or Marks and Sparks is the best. I didn’t know shipping was free if over $50. That is super! I wanted to comment that if you need to add something to help reach the free shipping minimum, look at the beauty section. Off the top of my head I think you wouldn’t go wrong getting something from Elemis, Pixi or their Rosie for Autograph collect. Cheers and happy shopping! Hey Frog!!! Thanks so much for the great tip!! I love finding all these amazing things from them!!! Such a treasure trove of finds! 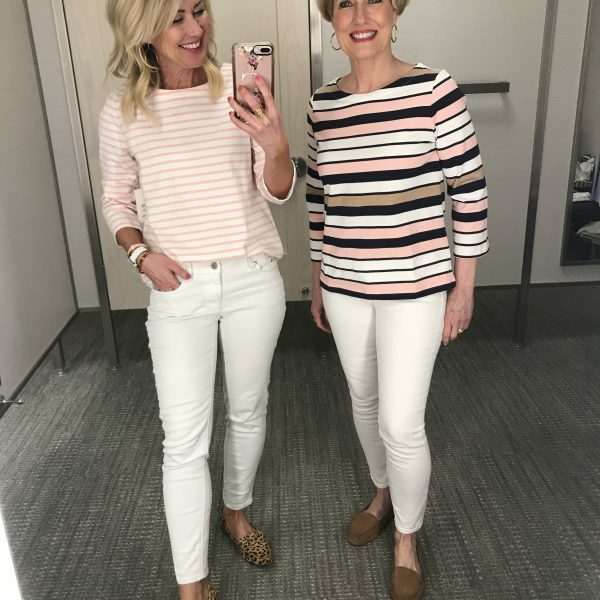 How do the sizes for M and S compare to Nordstroms? Since they’re European sizes, I err on the side of sizing up. I’m a small in most all of them, but usually wear an XS in US sizes. I love all these sweaters, especially the first one. I might need to do some shopping! Super cute picks.. really great sweaters! Hi I can’t seem to find the purse in the graphic. The link brings up a different one. Do you have the link to the one in the graphic? I think it sold out because I couldn’t find it anywhere on their site when I went back to link!! I’ve noticed their inventory sells quickly!